Making oats more awesome. No refined sugar. Dairy and gluten free. High in fibre. Wholegrain oats. Suitable for vegetarians and vegans.Did you know? Oat beta-glucan has been shown to lower blood cholesterol, which may reduce the risk of coronary heart disease. 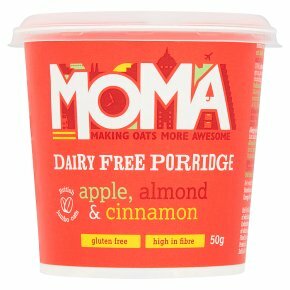 Our MOMA Apple & Cinnamon Porridge Pot (a 50g serving) provides 1.5g of beta-glucan from oats, which is 51% of 3g, the suggested daily amount. 1 Remove lid and boil the kettle. 2 Pour hot water to the fill line inside the pot. 3 Stir it up, the water level will drop but don't refill. 4 Wait five minutes then tuck in. Be careful as the pot will still be hot. If you want a thinner consistency add a little more hot water. It's an art not a science. You're getting about 190 calories of slow release energy to fuel you through your morning. Go get 'em tiger. Please don't reheat. Polish it off the first time round.